Courtesy of Tracy Chamberlain This sea of boulders, placed by developer Stephen Phinny to obstruct the disputed west-side easement, was removed by neighbors on Sunday, Nov. 15. Mari Herreras Stephen Phinny and Saguaro Ranch director of sales Mike Conlin point out details on a 3-D model of the property that takes center stage in the company's sales office. 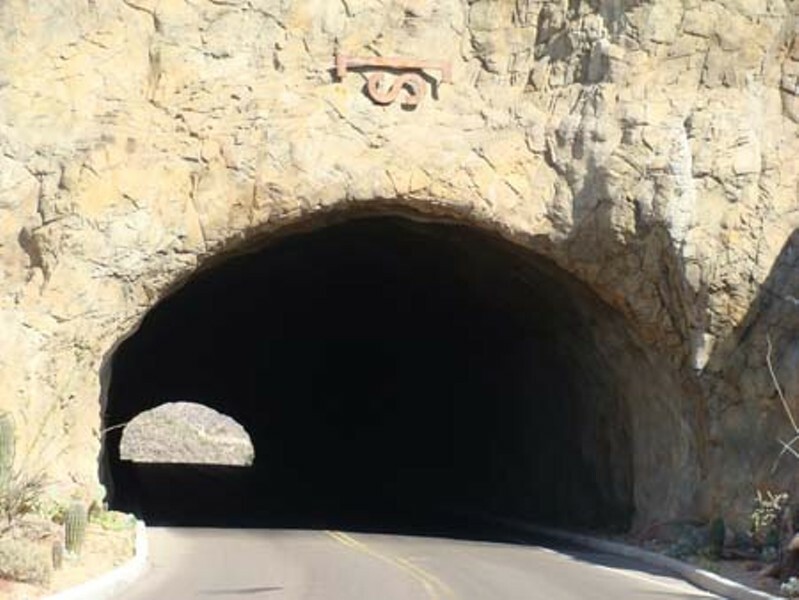 Mari Herreras This 700-foot tunnel is the only formal way in and out of Saguaro Ranch. Mari Herreras Saguaro Ranch neighbors have criticized this nursery area west of the development where saguaros lay rotting after being temporarily re-planted. Phinny admits that it's a challenge to figure out the best way to re-plant what he calls the "monarchs of the desert." Stephen Phinny and his neighbors agree on one thing: The Tortolita Mountains are beautiful. The hills are covered in old saguaros; the history of the region is evident in the petroglyphs hidden among the rocks and caves. Phinny, a former Telluride, Colo., resident and Gerber Foods heir, moved to Tucson almost a decade ago to purchase and piece together the 36 properties that would eventually form Saguaro Ranch. He marketed the development as an exclusive gated community—so exclusive, in fact, that the only way in is through a 700-foot tunnel blasted out of a solid rock hillside at the end of Thornydale. As Phinny completed the first part of the subdivision's infrastructure, neighbors kept walking through Saguaro Ranch on the easements they relied on for years before Phinny arrived in Arizona. But over the last three years, Phinny has put up locked gates at the access points—only to have neighbors cut the locks. Then Phinny put boulders across the entrances; neighbors removed them, only to see them return. To complicate matters, Phinny and his company are in Chapter 11 bankruptcy thanks to dozens of liens and lawsuits filed by unpaid contractors, equipment companies and other local businesses. Phinny's own Saguaro Ranch home even went into foreclosure. 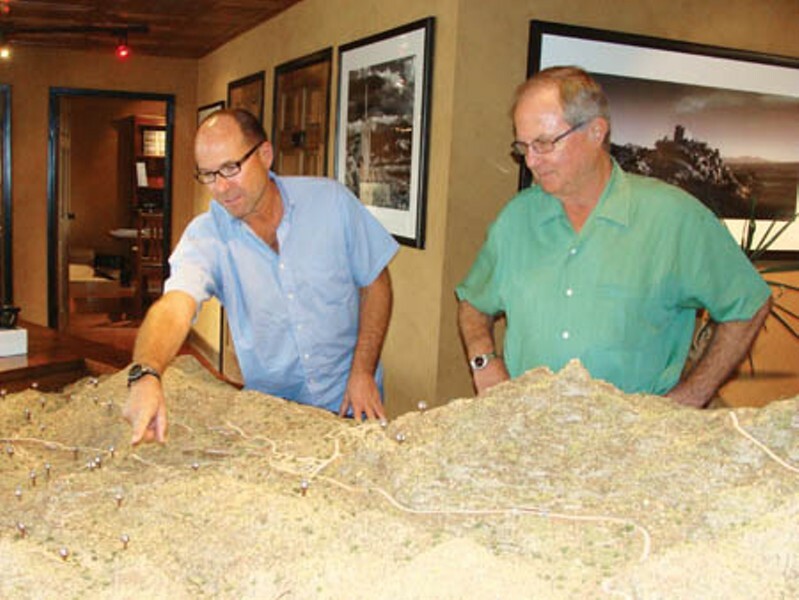 Despite the bankruptcy and the lawsuits, Phinny beams as he stands over a 3-D model of the property at the Saguaro Ranch sales office near the intersection of Thornydale and Moore roads. "It's pretty amazing, isn't it?" he says, pointing out the main entrance to the property and the location of McClintock's, the development's reservation-only restaurant (which sits on top of what neighbors claim is part of the west-side public easement). The fact that Phinny is talking to the Tucson Weekly is a surprise. For two years, he relied on his former attorney, Craig Keller, to be his media spokesperson. 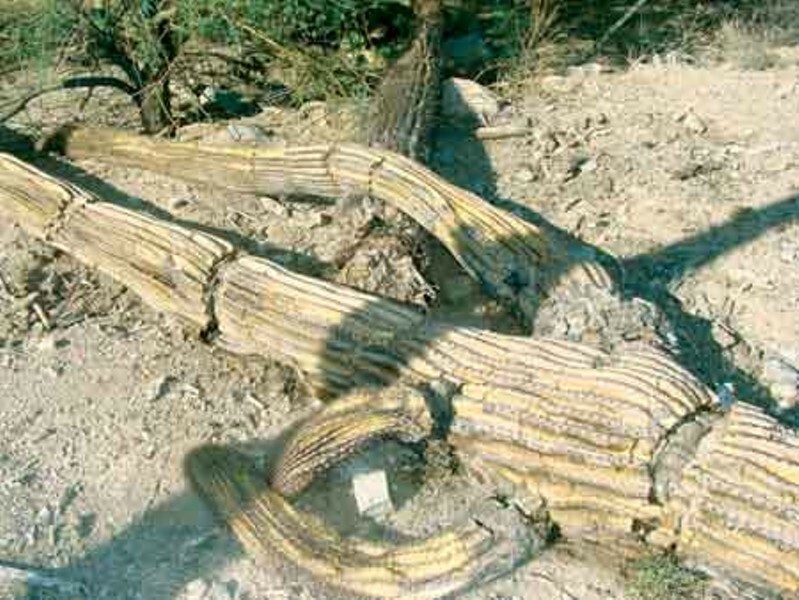 However, Phinny has now agreed to his first interview with the Weekly, and he also insists on giving a tour of his appropriately named subdivision—supposedly home to 17,000 saguaros, cataloged as part of the development's plan filed with the town of Marana. "This is really what makes this place special," Phinny says as he drives through the 700-foot tunnel and past the gatehouse. As an employee walks out and says hello, Phinny points out the gatehouse architecture, specifically the details of rock and wood, and the rusted metal roof. For the next hour, Phinny points out more of these details—like rocks from the property used in the buildings, old wood built around utility boxes, and rusted iron barricades along the roads. "The idea is to make all of this seem like it's always been here," he says. Phinny points out lots that have been sold and developed, but it's the vistas he stops for—big-sky views that make the Sonoran Desert known throughout the world. He also points out two of his neighbors' homes. Steven Blomquist and Sharyl Cummings, a married couple, live east of the development off Como Road; Tracy Chamberlain lives on the west side of Saguaro Ranch. These three are Phinny's biggest critics, a thorn in his side—and a pain in the neck to Marana officials. These neighbors have walked the easements almost nightly for two years (after walking the roads for exercise for years before, they say). They hold a bright sign declaring to those driving into the development for dinner at McClintock's that the road is, in fact, public. Usually, the walks end at the restaurant, so they can give customers an opportunity to see the sign. Phinny says these neighbors are criminals, because they are trespassing and disturbing his customers. "Our plan was, and always has been, to make Saguaro Ranch a private, gated community. The intent was never to have public access through Saguaro Ranch," Phinny says. The neighbors believe that Phinny knew about the public and deeded easements all along, but chose to ignore them. For example, they point to an engineering report (needed to put in a septic system) filed with the Pima County Department of Environmental Quality, on which part of the west-side easement is identified as a non-motorized path. However, those same neighbors say that they're even more upset about the fact that the town of Marana has bent over backward to support Saguaro Ranch, despite problems the neighbors have pointed out over the past decade. To better understand why these neighbors are angry at the town and the developer, Chamberlain says it's best to go back to the very beginning, when Phinny first arrived and started buying up parcels for a large development. A majority of those 36 parcels were part of the Tortolita Property Homeowners Association. Chamberlain, then president of the HOA, says Phinny came to one meeting to explain the project, but when she asked Phinny to come to more HOA meetings to help the organization survive, he essentially ignored her. "When I realized we were going to be under the five-person quorum we set in our bylaws, I asked him to send a representative to the meetings. We couldn't do basic business—not even issue dues notices. I contacted Phinny repeatedly," Chamberlain recalls. "It was June 2001. I called and told him, 'We need you now to be part of the board. You are affecting our ability to do road work (and) pay our insurance, and we need to have a meeting so we can collect the dues.' Then I started getting the stall, and later in the year, we accidentally found out they incorporated the HOA and put in their own board. They never came and told us." Chamberlain says what remained of her HOA unraveled. "We were defunct, and he knew it. He knew he was the reason," Chamberlain says. Phinny says that as the majority landowner, he was within his rights to incorporate the HOA, especially since he was developing a subdivision that didn't include the surrounding properties. Phinny went to the town of Marana with his plan for Saguaro Ranch—after Pima County rejected part of the original proposal. Phinny requested that the development be annexed into the town, a process which was completed in 2003. Again, Chamberlain says, her neighborhood was left out—they wanted to be annexed, too. She and her neighbors believed at first that everything north of the tunnel and east of the Thornydale right-of-way—including her home and those of her neighbors—was going to be annexed. "I told him, 'If they told you that, that's a bald-face lie. That is absolutely untrue. None of us are opposed to this.'" The town told Phinny that the annexation would be put on hold until he did a new survey and resubmitted the application. However, Chamberlain says that Phinny instead asked the town to move forward on the annexation he first submitted, and then move on to a second phase. "I voiced my concerns at the Town Council meeting. I was worried about us being clearly an island, cut off by the annexation. But this time around, I felt certain that because the town had caught (Saguaro Ranch) in a lie, and they knew how vulnerable it left us, that this time, (annexation) would happen," Chamberlain says. In 2004, Chamberlain signed a request for annexation, as did many of her neighbors. Town officials said they would hold a series of meetings prior to any annexation. In May 2005, Chamberlain was traveling through Dallas with her daughter. She says she got a call from someone at Saguaro Ranch asking her for a copy of her signed petition, because the town-imposed annexation deadline was coming up. "'What do you mean it's about to expire?'" she recalls responding. "'And besides, I've already submitted it a couple of times to different people (in the town of Marana). Why are you calling me, and how can it be expiring when we haven't had any meetings with the town?'" The Saguaro Ranch representative gave her a number to call, and the number ended up being the Marana staff person in charge of annexations and utilities. "I asked why the developer was calling me and was going to submit my petition to the town. I was told by the town's representative that Saguaro Ranch asked to be in charge of the annexation. Is this normally the way it goes ... that the developer is asked to handle the annexation of properties that are not their own after they deliberately kept us from being annexed before? Now we found a year later, after waiting for the meetings we were going to have, that the time to annex was going to expire? Amazing." Chamberlain says that when she returned home, she was told the town had decided not to annex her home. "I didn't understand," she says. "There were enough signatures and no opposition. I offered to get new petitions, but I was told no. 'How can you make us wait a year and have no meetings? If you can create an end date, can't the deadline be extended?' I was told no, and when I pressed for a reason, I was told they didn't have to have one." When asked about these matters, Gilbert Davidson explains that he became Marana's town manager less than two years ago. He doesn't know why these things happened, he says. However, it's now his job to deal with the feud between Phinny and his neighbors over the disputed easements. "I've often thought of what to do," he says. "I've been thinking for years, 'How do you resolve all these things?' Do I bring them all in a room and hash it out?" The neighbors say they've gone to town officials for help all along, but no one has taken their concerns seriously. The easement dispute heated up when Phinny's attorney, Craig Keller, delivered a letter to Chamberlain, Blomquist and Cummings on April 29, 2008, telling them that each time they walked the easements, they were trespassing. The letter also claims that the easements no longer exist: "(Y)ou no longer have a purpose for ingress and egress. There is no destination, use or purpose associated with whatever easement rights you claim." Last year, Marana Town Attorney Frank Cassidy told the Weekly that he hoped the dispute would end once either the neighbors or Saguaro Ranch officials went to Superior Court to get a judgment on the easements. "It's a real problem, because both sides feel they are on the right side," Cassidy said last year. "It's becoming difficult to stay neutral. I don't know how long we're going to be able to do that. ... We have the right to abandon it. As we tire of the fighting, it could happen." Chamberlain and her neighbors took Cassidy's advice to heart, and in June 2008, they filed a lawsuit. Shortly thereafter, news about Phinny's financial problems started to emerge. The $50 million loan he received from New Jersey-based Kennedy Funding was gone, and lot sales were down. Phinny's attorney blamed the economy. By December 2008, Phinny defaulted on the Kennedy loan and began Chapter 11 bankruptcy proceedings. As a result, a stay was put on the neighbors' lawsuit. And while the neighbors waited for their suit to be lifted by the bankruptcy court, the town of Marana began proceedings to abandon the public easement. During a packed meeting on Feb. 3, city manager Davidson told the Town Council that his office would do a three-part study to figure out whether they were doing the right thing. However, at a May 21 Town Council meeting, the council voted to abandon the easement. Chamberlain says there was no discussion about the promised study, and no one was allowed to speak to the council before the vote. Later, Chamberlain, through a public-records request, discovered that while the town was supposed to be doing a study, instead, city officials were contacting the county to build an alternative access point proposed by Phinny. In late April, Marana parks director Tom Ellis wrote an e-mail to county parks and recreation director Rafael Payan asking if the county was interested. Payan wrote back on May 1 that the county was indeed interested. The town of Marana then sent a letter on May 7 to Pima County saying the town would take the lead in developing the point of access proposed by Saguaro Ranch, and would pay many of the associated costs. After the May 21 vote, Cassidy declared that "anyone walking or driving as a member of the public on the portions of the easement located within the town limits of the town of Marana will be treated as a trespasser, and will be subject to arrest and prosecution at the discretion of the investigating officer." Several days later, Blomquist and Cummings were warned by Marana Police that they could be arrested for trespassing. The next day, Blomquist, Cummings and Chamberlain received criminal-trespassing citations. On Oct. 15, Oro Valley Municipal Court Judge George Dunscomb dismissed all criminal-trespass charges, and even admonished Marana's actions as an improper use of the criminal process. Phinny says his neighbors' defeat of the trespassing charges happened only because nobody from the town of Marana was there to make their case. "I wish someone had showed up from Marana to represent the other side. But at the end of day, they were trespassing. If I was to parade up and down their driveways with signs in front, on their property, they'd be opposed. The long short of it: It is part of a private, gated community that is now recognized by the town," Phinny says. The neighbors filed a second lawsuit this spring, against the town of Marana, challenging the decision to abandon the easement. Phinny says that despite the economic challenges—the last time a lot in the development was sold was in February 2008—he is confident that he and the town of Marana will succeed. "The intent was never to have public access through Saguaro Ranch," Phinny says. According to Marana Police Department records, Phinny is still trying to get trespassing charges to stick. Phinny and his employees have regularly called police when Chamberlain, Blomquist and Cummings walk the easement and protest outside of McClintock's. According to a recent police report, an officer told the restaurant manager that the best thing to do was to get a third party—someone who doesn't work for Saguaro Ranch—to complain. "We've had numerous people and guests that have complained," Phinny replies. Phinny has more to worry about beyond trespassing. After all, there's the bankruptcy, which Phinny jokes that he prefers to call a "reorganization." Chapter 11, he says, is giving the development a chance to survive the economic downturn, and he expects his fortunes to start changing after Thanksgiving. "I'm committed. We're here to stay. I really put a lot of blood, sweat and tears in this, and worked very hard to build something that I think is one-of-a-kind and very environmentally sensitive. We have done everything that everybody has asked us to do. I'm not a bad developer," Phinny says. When asked if he would do anything differently, he says he wishes he'd started the project a couple of years earlier to beat the economic collapse. Phinny doesn't say whether he's been successful in securing additional financing. "I think we're going to be very successful, and we have a fabulous project. We have a huge amount of equity, and I think the town has recognized our project. We're in a good place. I don't think (the bankruptcy) will hurt us." Meanwhile, Marana officials stand fully behind the development, a fact that becomes clear when Davidson and Ellis, sit down to discuss Saguaro Ranch. 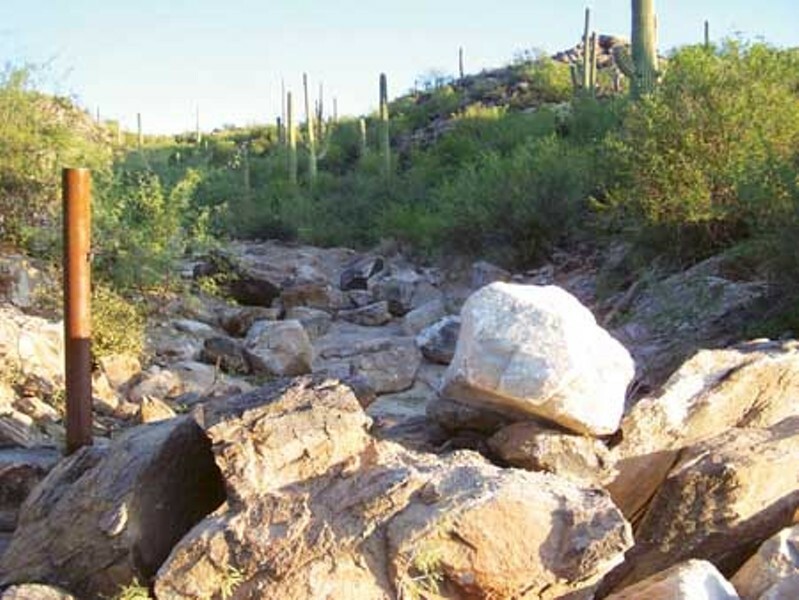 "This (west side) easement was never part of the overall plan of Saguaro Ranch or the town having access into Tortolita Mountain Park," Davidson says. "The town never identified these roads through our park's master plan. It's become a lightning-rod issue, and our approach to it has been, 'Let's look at it as part of a global view.' ... We've been working closely with Pima County and the town of Oro Valley, and residents of the Dove Mountain area. They have all been able to be part of these discussions," Davidson says. However, the fact that Marana is in discussions with these incorporated communities feels like a smack in the face to Chamberlain and her neighbors who live in unincorporated Pima County. "Where are our representatives in all of this? Our property taxes do not indicate that our rights or lands are irrelevant—not when my taxes have more than tripled in the last couple of years," Chamberlain says. "Those of us who have been left in no-man's land do not have development staff, town attorneys, town managers or council members who are concerned about our rights. Again, where are our Pima County representatives who were elected to represent the taxpayers of Pima County?" Right now, the Wild Burro trailhead offers the only public access into the Tortolita Mountain Park; it is located near the Ritz-Carlton Dove Mountain resort. Another access point, on the other side of the park in Pinal County, is in the early planning stages. Chamberlain says she finds it odd that Pima County taxpayers might have to go through Pinal County to use a Pima County-owned park. Eric Sparks is representing Phinny and Saguaro Ranch in the bankruptcy. He says he has faith that his client will be able to pay off all of his creditors in three to five years. "He's gone back to revisit his proposal. He's convinced he'll have creditors paid," Sparks says. In bankruptcy filings, the town of Marana and its officials are listed as potentially owing Phinny and Saguaro Ranch $135 million. The neighbors have cited this as a potential threat against Marana—a threat that could have led the town to abandon the easement. However, Davidson says the Town Council made the abandonment decision on its own merits. "The easement has nothing to do with the bankruptcy," he says. "We did not pursue it, and the town went ahead and abandoned the easement," Sparks says. Listing that on the bankruptcy wasn't supposed to be a threat against Marana, Sparks says; he was just protecting his client. "It's part of bankruptcy law," Sparks says. "If you do not list your causes of action or disclose possible causes of action, you may later lose the ability to bring that before the courts. There's a sense of caution that all good bankruptcy attorneys have. I didn't want to take a chance." The neighbors' first lawsuit against Phinny regarding the public easement is expected to go before the bankruptcy court in January, according to Cummings. She and Blomquist will continue to picket outside McClintock's most evenings. While the restaurant hasn't been terribly busy lately, Cummings says she and Blomquist expect to see more customers with the arrival of cooler weather. "For the most part, though, it's pretty quiet up there," she says. Cummings admits that at times, she's considered throwing in the towel. "Then I ask myself. 'What is quality (of life) if you don't stand up for it? If you don't, then you're not going to have it anywhere, and someone is going to take it.' So you have to stand up for your rights," Cummings says. "What's been hard is dealing with the town of Marana. They are not for the people, but for themselves. What happened to the three-part study they were going to do and then get back to us? They most certainly didn't get back to anybody. Even at that Town Council meeting, they held it on a day that the council normally doesn't meet, and they put it on a consent agenda and didn't allow us to speak," Cummings says. She still hopes the county and Marana can somehow be convinced to use the disputed easements to access Tortolita Mountain Park. "It's a shame to just give them up," she says. "I find it interesting that a county would purchase a park area, and not plan for vehicular access, especially when there is land that can provide vehicular access." Davidson says having vehicular access to the park was never considered. "That's why we've never identified that as a public road. As the property was developed, and as the developer acquired parcels, the road was never identified as a public road," Davidson says. "Saguaro Ranch has complied throughout the whole process. I see this now as entirely a civil issue. If (the neighbors) win their case, that's fine. I'll have no problem with that."